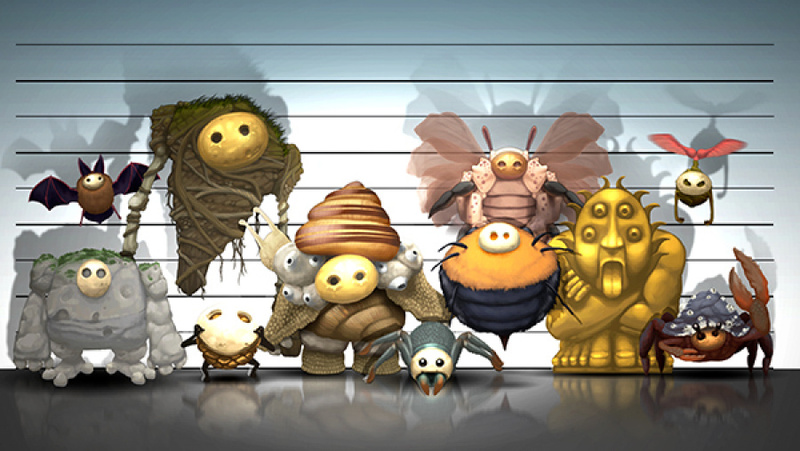 A German USK rating has confirmed that tower defense title Pixeljunk Monsters is Wii U-bound. Originally exclusive to Sony systems, the PixelJunk series is created by Star Fox Command and Star Fox 64 3D studio Q-Games - the founder of which is none other than Dylan Cuthbert, a former Nintendo staffer who was instrumental in the development of the original Star Fox on the SNES. PixelJunk Monsters originally hit the PS3, while a deluxe version exists for the PlayStation Portable. The USK listing doesn't state which version we're getting, but a fair bet would be the Ultimate HD edition, which comes with additional content and arrived on the PS Vita not so long ago. Interestingly, Sony actually published the original game on its consoles - this version is being published by Double Eleven, which also handled the release of the game on Steam. I really enjoyed this game back when it came out, when TD was all the rage. But then I got stuck and stopped. I'm not much for overcoming obstacles. And I could really see this game being greatly improved w/ stylus controls, unlike Rakoo yesterday which was plagued by them on my tablet. It would actually be almost a completely different game if we could just tap stuff rather than having to run around all over the place trying to collect money. hmm, I almost never double dip, but I'm intrigued. OK, watched the vid, stylus seems a given, couch co-op w/ the Wiimote or Pro would probably make it Day 1. Odd...almost as odd as the Super Star Wars games on PSN. I own the game on PS3. It's a good game, I highly recommend it for people who like Tower Defense games. I got the game for a buck in a flash sale on PSN. It's great in co-op, but I thought it was frustrating to play alone. I'm glad it's coming to the Wii U, but I probably won't be getting it again. I remember this game. I played a bit of it with a group of friends on the PS3, and we were all shouting out at once suggesting where the players should build towers. I might pick it up if it comes to Wii U. One of the best (and hardest) TD games I played! Might pick it up again. There are genres I don't personally enjoy like sports, MMORPG, RTS, and RPGs but I at least see the appeal. But tower defense... The appeal truly eludes me. Not that keen for this, but I did get Pixeljunk Shooter on my PS3 and it rocks. Totally would love it on Wii U.
Yeah, I stopped reading at "tower defense". Okay, not really, but I could have. The genre hasn't appealed to me for a while now. Exclusivity for such titles is really bad in general. Games like this should target all platforms. I doubt that this was a big seller on the PSN Store. I'm not interested in Tower Defense at all, but it sure has it's target demographic. Mostly on mobile devices though. I've heard of this game, but being out of the Playstation console cycle for the last two gens, I have kinda missed it. Wouldn't mind giving it a try. Looks good but right now zombie defense is filling that void, it's quite addictive. Sony and Nintendo should merge, that way they could discuss a strategy suitable for distributing games on each others' systems as well as mobile. It doesn't look like my style, but the more the merrier, as they say! Fairly decent as far as Tower Defence goes. Not really my thing to be honest. Now if Wii U gets the sublime Pixeljunk Shooter, that would be exciting news. Eh, not a fan of tower defense at all, but why not? More platforms are always a good thing for 3rd parties. @MamaLuigi It's very unlikely that Nintendo and Sony will ever team up again, considering that Nintendo basically brought Sony upon themselves. This is an great TD title day one for me it would be awesome if they would add some new content for the Wii U version definitely one of the most challenging TD titles I've played but also alot fun now if Nintendo would give a new HD Version OF STARSHIP DEFENSE I would be soooooo happy ., hint-hint Nintendo . Just to mention another great pixeljunk title that would be amazing on the Wii U is Eden I spent hours and hours on that game with friends such an awesome title. Alright, that looks like fun! Definitely on my radar! I LOVED this game, and it will be a perfect fit for the Wii-U. I was so addicted to this on PS3, couldn't stop playing! 2 surprises here.. Sony exclusive to Wii U, and they also made 2.5 Starfox games. "What's that coming over the hill?" I couldn't help but notice "Over the hill" is also the map theme for the classic-ish, throwback-y Final Fantasy title among the three ones after the series became a PlayStation flagship franchise (namely, Final Fantasy IX; the others are the seventh and the eighth). Was that a sly reference (heh heh... Sly) to how what goes around comes around or am I over-analyzing things? @AlexSora89 I think they just meant to say that the game is coming, while referencing the song 'Monster' by a band called The Automatic. I think it's a British thing. @Moon that's the way that I took it. I love the music video to that. This game in particular introduced me to the Tower Defense genre. I'm not a HUGE fan, but I will play it again. I never did beat it, after all, and frankly it's because I felt it was too slow on the PS3. I really enjoy Tower Defence but didn't get on so well with this one. The PixelJunk series in general is pretty great though, Shooter and Shooter 2 were my personal highlights. Would especially love to see them come across. I have all of the Pixel Junk titles on the PS3, and this is definitely a good one! I'd re-buy it again for the Wii U! One of my favorite tower-defense titles!